threading words together, trinkets on a string. and fusing the colors back into pure, white light. of words-made-flesh dwelling within us. from the humble box we keep empty for them. 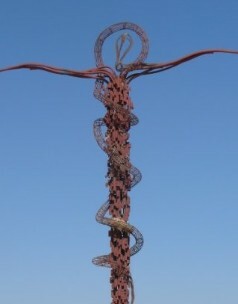 I took this picture of the Serpentine Cross sculpture when we visited the Franciscan Monastery on top of Mt. Nebo, Jordan. It recalls the bronze serpent of Moses, the healing sign of the caduceus, and the cross of Christ. Writing is often a lonely endeavor, and the hearts of those engaged in it can easily be dragged down by self-doubt and discouragement. Here's a few quotes that might help. "If you want to double your success rate, triple your failure rate." --Cory Doctorow. "Writing a first draft is very much like watching a Polaroid develop. You can't--and in fact, you're not supposed to--know exactly what the picture is going to look like until it has finished developing." --- Ann Lamott, Bird by Bird. "If you are never satisfied with what you write, that is a good sign. It means your vision can see so far that it is hard to catch up with it." --Brenda Ueland, IfYou Want to Write. "Better to start something poorly than not start at all. Everything we do, like walking or talking, we started out doing badly." --McNair Wilson. But the best source of inspiration for me is "Leaf by Niggle," by J.R.R. Tolkien. It's about a little man called Niggle, who was a painter. "He had a number of pictures on hand; most of them were too large and ambitious for his skill." What happens to this lowly artist always brings a a lump of joy to my throat. The story is found in Tolkien's Tree and Leaf. http://writing-world.com/ is crammed with practical information on just about every aspect of writing. http://www.duotrope.com is a gold mine of information when you're wondering where to submit a story or poem. The mind-boggling pictures in Astronomy Picture of the Day can help you really expand your horizons!